Sydney is well know as the 'silver city' and it's CBD district is unrivalled for shine and sparkle from high rise skyscrapers, the architectural giants of the new world. The city CBD provides a very different backdrop for your wedding photos, so why not add a cool modern look to your wedding photos by including some city scape locations? Downtown Sydney is an obvious choice, but also look to North Sydney, and even Chatswood for some silver high rises and skyscrapers. And you dont need to get up close and personal with these towering buildings as they can form a stunning skyline from places like Glebe, Annadale, Taronga Zoo and other Harbour locations. We detail below a number of Sydney city scape photo locations. 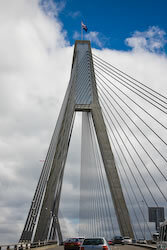 Anzac Bridge is a distinctive backdrop for wedding photos in Sydney. The long wires form great vertical converging lines that look brilliant in photos both colour and black and white. The end furtherest from the city is the best location as you can look back towards Sydney CBD and have all the skycrapers and lights at night of the city. Another option for those with a convertible wedding car is some shots driving over the bridge itself!